On Wednesday, August 3, our summer lecture series continues with Dr. Kathleen Bartoloni-Tuazon’s book talk about her recent publication For Fear of An Elective King: George Washington and the Presidential Title Controversy of 1789. Here, she offers a preview of her work. A limited number of books will be available for purchase at the talk. Pre-registration is requested. I should like to be informed … of the public opinion of … myself—not so much of what may be thought the commendable parts, if any, of my conduct, as of those which are conceived to blemishes. … If they are really such, the knowledge of them … will go more than half way towards effecting a reform. So wrote George Washington to his son-in-law and confidant David Stuart in July of 1789, in the early months of his presidency. He asked Stuart to be his confidential informant about his conduct as president and to write to him “without any reserve.” Washington realized the difficult and controversial position he had inherited with the office of the presidency. His continued popularity derived from more than his war hero status—it also stemmed from his ability to apprehend and reflect the pulse of popular opinion. Importantly, Washington comprehended the importance of the will of the people under the Constitution. He told Stuart that he wanted to know about local attitudes toward his leadership and correct any misunderstandings since “at a distance from the theatre of action, truth is not always related without embellishments.” He understood that calming public fears about the presidency—by mirroring public opinion when he agreed with it or considering a modification of his positions if the people demanded it—was an integral part of his leadership and even pledged to Stuart that he would reevaluate his stances and “effect a reform” if the public deemed his actions misguided. Washington recognized that “the eyes of America—perhaps of the world—are turned to this Government.” Perhaps no one was watched more closely than Washington. Yet, in the spring of 1789, within weeks of the beginning of the first Congress under the new Constitution and even before Washington had been inaugurated, the House and the Senate became embroiled in their first dispute—how to address the president. The Senate majority favored a lofty title, while the House stood unanimously and adamantly opposed to anything more than the simple and unadorned “President.” The debate spilled far beyond the chamber doors and raged all summer long—Congress, the press, and individuals throughout the country debated more than thirty titles, most with royal overtones. Indeed, the eventual resolution in favor of the modest title of “President,” without an exalted introduction like some form of “Highness” or “Majesty,” was far from certain in a world that remained full of monarchs. In 1789, much of America recognized the need for presidential authority and energetic leadership despite the ever-present alarm over the potentially abusive power or weak corruptibility of the office. Nothing signaled these apprehensions over the presidency more than the unanimous election of universally trusted George Washington as the new nation’s first president. To his credit, Washington understood this. Although his celebrity encouraged an elite court-like atmosphere wherever he went, Washington counteracted these tendencies early on with his opposition to a regal title. During the title controversy, he brought to his leadership both a widely admired perspective of republican reserve and a willingness to take cues from the people. By consciously mirroring the views of the majority of his countrymen and women, who disdained regal titles as he did, he encouraged public acceptance of the presidency, which added political legitimacy to the office and the new national government. During the unsettled early days of the Constitutional era, Washington imagined a course for the emerging nation’s executive that calmed public fears about the office by embracing the principles of modesty and a nod to the people. The republican resolution of the title controversy, a simple civic title of “President,” which both Washington and the people supported, established an approach to leadership and authority that fledged the presidency’s power by not flaunting it. George Washington to David Stuart, July 26, 1789, William Wright Abbot, Dorothy Twohig, Philander D. Chase, David R. Hoth, Christine Sternberg Patrick, and Theodore J. Crackel, eds. The Papers of George Washington: Presidential Series (PGW; Presidential). 14 vols. (Charlottesville: University Press of Virginia, 1987—), 3:321–27. We’re marking the anniversary of Brumidi’s birth by revisiting remarks from a 2015 celebration. See here for Part 1. So, what role did his experiences have in Constantino Brumidi’s removal to America? Did it really make him a “refugee” rather than just an “immigrant”? In other words, did he feel that he had a choice in whether to stay or go, after his release? Instead of hearing Brumidi invoke human and civil rights like freedom of expression, we find him bargaining with the Vatican for his release—within months of his arrest, and well before his conviction—so that he can go to America to broaden his commercial opportunities as an artist. It is not a promise to remove a political thorn from the backside of Pius’ restored and increasingly reactionary regime. Maybe Brumidi just expressed his bargaining position this way because it sounded more noble than groveling for forgiveness for the consequences of supposed political crimes. But there is no evidence that Brumidi remained under any police surveillance, much less sanctions, following his pardon. It certainly can’t be said that his flight to America constituted an indictment of the corruption of Church governance. And in fact, from almost the moment he arrived in the New World, his steady flower of art commissions for religious institutions comprise a kind of “seal of approval” by high churchmen who could not have been ignorant of Brumidi’s prior run-ins with the Church. Another way to think about the question of “refugee” versus “immigrant” is to consider what America was offering as an alternative to the world Brumidi was leaving behind. Brumidi disembarked in New York City in September 1852—one of the 45,000 Italians who would arrive in America by 1870, during the first wave of Italian Immigration. (A second “great wave” of Italian immigration, the one we associate with old family photos from Ellis Island, lasted from the 1890s to the 1920s—when a young Italian farmboy named Carmen diGiacomantonio landed there, whose grandson is speaking to you now. There are others here today with similar stories, I know.) Brumidi’s work in the U.S. Capitol followed his personal introduction to Montgomery Meigs two years later, in December 1854. We all know that Brumidi would become a favorite among the many foreign artists whom Meigs employed and his preferment must seem to us, from this vantage point, as one of those inevitabilities of history. But of course nothing in history is inevitable. And in fact, Brumidi’s employment on the Capitol faced a serious backlash against what was seen as an over-reliance on foreign-born artists, to the exclusion of native born artists. Recall that Brumidi’s first years in America coincided with the high-water mark of the Know-Nothing movement. In 1854—the very year Brumidi was first introduced to Meigs—the Know-Nothings reached the height of their political influence as a nativist, “America first,” anti-immigrant and anti-Catholic movement—owing in no small part to the notoriety of Pio Nono’s “un-American” form of political repression. The 1850s was not the first time, and it wouldn’t be the last time, that native-born American workers would resent foreign hires. (Peter L’Enfant had been pilloried in the press for hiring too many fellow Frenchmen when he converted New York’s old city hall into the nation’s first Capitol—Federal Hall—in 1788.) But to an artist seeking freedom of expression, it must come as rude awakening, whenever it happens. We have Brumidi’s own word for it, that he eventually came to regard America as a land of unequaled political freedom and economic opportunity. The commemorative plaque we passed coming into the cemetery today is testimony that as early as 1855 Brumidi considered his new mission in life “to make beautiful the capitol of the one country on earth in which there is liberty.” I would only suggest that perhaps that sense of mission was forged less out of fear of the past that optimism for the future. It does no disservice to Brumidi’s unquestioned sense of patriotism to say that his immigrating had less to do with being driven into a forced exile from a land of despotism, than freely seeking and embracing new, liberal traditions of political freedom and economic opportunity. Constantino Brumidi: Refugee or Immigrant? To mark the 211th birthday of the Capitol’s premier artist, Constantino Brumidi, we are posting the remarks presented at last year’s 210th birthday observance in a ceremony at Brumidi’s gravesite in DC’s Glenwood Cemetery (2219 Lincoln Rd., NE). There, a small but devoted and enthusiastic fellowship gathered to hear the USCHS’s chief historian, Chuck diGiacomantonio, talk about Brumidi’s coming to America. The group then laid flowers at Brumidi’s grave, shared thoughts about the artist, and afterwards re-convened at a local pizza joint for celebratory food and drink. The Constantino Brumidi Alliance and the USCHS hope to make the observance an annual event. Stay posted for announcements on the USCHS website as next July rolls around…. Part 2 will be published on Wednesday. The title’s word choice is more than just boilerplate. It is meant to focus some perspective not on what Brumidi was coming to, but what he was leaving behind. As Brumidi’s “Apotheosis of Washington” goes into exile behind sheets and scaffolding, we might ask whether Brumidi’s removal to America was also a form of exile, as it is usually described. Then we might each play amateur art critic and better speculate how Brumidi’s Old World experience influenced his artistic themes and motives once he was here. The image that often comes to mind of Brumidi the man is that of a short (5’5”), stocky, dark-complexioned, vaguely foreign looking middle-aged man, sporting a hefty Karl-Marx-like beard. But picture, if you can, Brumidi a few decades younger than that. The probably much more dashing artist, half-Greek and half-Italian, was barely thirty when he executed his first major art commissions at the Palazzo Torlonia in his native Rome. The Torlonia family was so impressed that they retained him to work on the Villa Torlonia as well. In 1840 he attracted the attention of connoisseurs in the Curia, who hired him to rework some of the High-Renaissance era Loggias in the Vatican. He was already being regarded as one of Rome’s greatest artists by the time he painted Pius IX in 1847. Pius IX became a major character in the story of Brumidi’s relocation to America, so he deserves more than just passing reference. His election in 1846 was regarded, justifiably, as a liberal turning point for the Church both spiritual and temporal. Peter’s successor, we’ll recall, was the ruling autocrat of a large swath of central Italy. And although the Papal States had already come to be seen as a plaything in European geopolitics, the Pope’s powers at home were more than just those of a figurehead. In time, Pius IX would become known as “Pio Nono”—which by a slight twist of pronunciation, can be made to mean not only “Pius the Ninth” but “Grandfather Pius”—which was an especially apt description of the man who would become the longest-reigning Pope in history. At his election, he was also one of the youngest popes—a quality that Brumidi captures in his portrait of the energetic, debonair looking Pius in 1847, one year in his papacy. Pio Nono became the first Pope actually to step on U.S. sovereign territory when he alighted on the deck of the USS Constitution off the coast of Gaeta, Italy, in August 1850. History found Pio Nono in Gaeta as an exile from his experiment in liberalization gone awry. Infected by the so-called “Revolutions of 1848” against the post-Napoleonic reactionary settlement of Europe, Rome rose up against the Pope and established a Republic in 1849. Brumidi, who had been serving as captain in the city’s militia under the old regime, naturally transferred his allegiance to the new regime. The Republic was suppressed after just a year (thanks, in part, to the pious intervention of Napoleon’s own nephew, Napoleon III), and Brumidi continued his painting uninterrupted—even completing one of his masterpieces, Rome’s Church of the Madonna dell’Archetto, within months of the Republic’s downfall. But by the time critics were praising his latest masterpiece, declaring Brumidi second only to the great painters of the High renaissance, he was already in jail on accusations of stealing art work from convents and monasteries during the short-lived revolt. He was found guilty in January 1852 and sentenced to 18 years—which was quickly reduced. He was pardoned altogether just two months later. And five months after that, he embarked for America. So, what role did this experience have in Brumidi’s removal to America? Did it really make him a “refugee” rather than just an “immigrant”? In other words, did he feel that he had a choice in whether to stay or go, after his release? Come back for Part 2 on Wednesday! In the comments, let us know if what you think about Brumidi’s status as an immigrant or refugee. On May 5 and 6, the U.S. Capitol Historical Society will host its annual symposium on congressional history. After a dozen years on a chronological journey through the sectional conflicts that dominated much of the nineteenth century, this year we shift gears to trace one topic that appears repeatedly in American history. Discussions about immigration, related legislation, and consequences of reforms or changes to current laws are sprinkled across the pages of current events news and campaign coverage; these topics pepper conversations around the country. Congress and a Nation of Immigrants, 1790-1990: From the First Naturalization Act to the Simpson-Mazzoli Act will examine the historical underpinnings of these current debates through various lenses, including race, quotas, politics, and popular culture. As speakers consider immigration law and related issues, they will detail and challenge popular perceptions of racial, ethnic, and political differences in American society. Speaker Lance Sussman (Reform Congregation Keneseth Israel; Gratz College) is focusing his talk on Rep. Emanuel Celler, one of the namesakes of the landmark 1965 immigration legislation that shifted U.S. immigration policy away from primary reliance on quotas based on national origins and toward skill- and family-based preferences. The title of the talk, “Reopening the Golden Door: Congressman Emanuel Celler’s 40 Year Struggle for Immigration Reform, 1924-1965”, initially suggested to me that Celler retired, covered in glory, shortly after winning an extended battle over immigration policy, but Celler had a fifty-year career that spanned the mid-twentieth century and its dominant issues, including the New Deal, WWII, the Red Scare, the civil rights movement, and feminism. Rep. Emanuel Celler in 1951. Courtesy New York World-Telegram and the Sun Newspaper Photograph Collection (Library of Congress). Celler entered the House just in time to (unsuccessfully) fight against the 1924 Johnson-Reed Act, which barred Asian immigration and limited immigration from many countries in an attempt to maintain the racial and national origin status quo in the United States. Celler, representing a Brooklyn district full of immigrants of varied backgrounds (including many from eastern or southern Europe) and their descendants, objected to legislation that would limit future immigration from many of their homelands. The 1965 Hart-Celler Act was certainly a centerpiece in Celler’s work on immigration reform, but when looking at his career as a whole, writers tend to classify it as an example of his ongoing work on civil rights legislation. Celler chaired the House Committee on the Judiciary almost continuously throughout the 1950s and 60s and authored, co-authored, or otherwise championed the groundbreaking civil rights acts of the period. Celler supported New Deal programs, urged FDR to accept more Jewish refugees during WWII, and opposed the House Unamerican Activities Committee. Ironically, another facet of the civil rights era shaped the end of his congressional career. Celler lost the 1972 Democratic primary to Elizabeth Holtzman, who highlighted his opposition to the Equal Rights Amendment and his support for the Vietnam War while running the same kind of underdog, grass-roots, on-the-street campaign that Cellar had run when he first won his seat in 1922. The upcoming symposium is free and open to the public, so if you’re in DC, join us May 5 and 6 on Capitol Hill to learn more about immigration legislation throughout American history. Pre-register here! The schedule is posted on our website, and Sussman will speak about Celler’s work on immigration reform at 10 am on May 6. Biographical Directory of the United States Congress. Emanuel Celler and Elizabeth Holtman. Carroll, Maurice. “Emanuel Celler, Former Brooklyn Congressman, Dies at 92.” The New York Times (New York): January 16, 1981. Kammer, Jerry. “The Hart-Celler Immigration Act of 1965.” Center for Immigration Studies website: October 2015. Wasniewski, Matthew, editor in chief. “Elizabeth Holtzman,” Women in Congress, 1917-2006, p. 482-487. Washington, DC: 2006. Francis Doughty: Visionary or Trouble Maker? Today we welcome Mau van Duren to the USCHS blog! He will be discussing his new book, Many Heads and Many Hands: James Madison’s Search for a More Perfect Union, in Washington, DC on Wednesday, April 13 at noon. The event is free and open to the public, though pre-registration is requested, and will be held in Ketchum Hall in the VFW Building at 200 Maryland Ave. NE, Washington, DC 20002. James Madison added concepts to our Constitution that found their origins in Continental Europe. The Dutch Republic proved a major conduit and originator of innovations in governance and civil liberties. Taxation with Representation was enshrined in the Dutch Constitution of 1477. Freedom of Religion and Freedom of the Press (free speech) were introduced in 1568. Secular Marriage and an Independent Judiciary existed in the Republic well before others introduced them. In the late 16th century and first half of the 17th century, the Republic was a refuge for Europeans who had escaped religious persecution in countries as diverse as England, Germany, France, Spanish Netherlands, Poland, and Sweden. All were Protestants of one flavor or another, and they brought with them the languages and cultures of their people. Many settled in Amsterdam and many in Leyden. That small city was then the center of the cloth trade and manufacture but, perhaps more importantly, it was the center of enlightenment, education, and science. Descartes, Grotius, and other greats taught there. Isaac Newton published all his books there. Many of the foreign settlers were country folk and could not get used to city life and made use of the opportunity life in the New World might afford them. Affected by the sophistication around them, they carried the patently Dutch concepts and values with them and implemented what they could in their new environment. Strongest among them were the Separatists whom we now know as the Pilgrim Fathers. Other denominations settled in New Netherlands, Jamestown, and Rhode Island. Religious refugees who had no connection with the Dutch Republic were the settlers of Massachusetts Bay, the Puritans. And they brought with them patently English concepts and values. One man and his young family came to America in the early 1630s. He set foot among the Pilgrims in Plimoth Plantation, preached among the Puritans in Plimoth’s Cohannet, briefly settled among the Free in Rhode Island Plantation, became a civil liberties advocate in New Amsterdam, preached on the Eastern Shore of Maryland, founded a school further south in Virginia, farmed along the Rappahannock, and eventually disappeared in the fog of time. In every colony Doughty set foot, he experienced the birth, infancy, and growing pains of virtual republics. He saw the development of the rule of law and democracy. He suffered the small-mindedness of religious intolerance in Massachusetts, lived among the free in Rhode Island, learned about the powers, and limitations, of the people of New Netherlands, and witnessed the evolution of participatory government in both Virginia and Maryland. Mostly he followed in the footsteps of others, but in New Netherlands he was, briefly, a pioneer. He mixed with the movers and shakers, and quite literally, lived the beginnings of what would become the American Nation. UPDATE: Gueli’s talk has been rescheduled, for Wednesday, May 18. See our website for more information about her book. On Wednesday, March 16, the U.S. Capitol Historical Society will host Cindy Gueli for a noon brown bag. She’ll be speaking about her book, Lipstick Brigade: The Untold True Story of Washington’s World War II Government Girls. Join us for this free event (but pre-register here if possible), or simply read on to learn more about one episode pitting the women against some Members of Congress. They were young. Most were single. They were colloquially known as Government Girls. And during World War II, this clerical corps almost 200,000 strong kept Washington’s federal agencies functioning. The massive bureaucratic demands of running a war sent recruiters all over the country seeking adventurous young women willing to relocate to the nation’s capital. Joining the war effort as a civilian or with the military offered women a chance to patriotically serve their country and explore personal and professional prospects for the future. Over the course of the war, Government Girls would turn the usually sedate capital into a rollicking boomtown. Government girls and their dates play tourist on the Capitol lawn in 1943. However, not everyone was happy with the thousands of young women let loose in Washington. Conflicts over expectations of how these women—most in their early twenties—should dress, act, and socialize erupted between barrier-breaking Government Girls and more conservative local and federal officials. One such public battle originated in Congress. Government Girls’ unrestrained social lives as both improper for respectable young women and detrimental to the war effort. In 1942 he proposed a 10 pm nightly curfew for all (and only) female federal workers. This, he claimed, would keep the women “healthier, frisky and fine.” He suggested that boarding house owners and federal dorm managers could enforce the women’s bedtime. Congressional debates over the issue crossed party and gender lines. Rep. Clare Hoffman (R-MI) supported the curfew because she once saw Government Girls smoking and fixing their nails outside of an office building. Congressmen Karl Stefan (R-NE) and Robert Ramspeck (D-GA) agreed that Government Girls lacked a sense of wartime urgency and supported a thorough investigation. On the other side of the argument, Hattie Caraway (D-AR)—the only woman in the Senate—was the most ardent defender of Government Girls. She argued: “If the girls are old enough to be away from home to work here, they ought to be able to take care of themselves.” Caraway was backed by Congressmen Jennings Randolph (D-WV) and Victor Wickersham (D-OK) who spoke out against strict regulations because Government Girls were the backbone of the federal agencies. As no hard evidence existed to support Wilson’s allegations, his attempt to rein in Government Girls like misbehaving schoolgirls failed. The women’s social lives would continue to cause local and official consternation throughout the war. However, Congress would make no more attempts to control them. Over half of all wartime workers who came to D.C. stayed in the city after the war. Former Government Girls found postwar clerical work within every department of the federal government, including the legislative offices on Capitol Hill. Related: more information on one building where Government Girls lived in DC. Gueli is an author and media professional who worked as a consultant on Showtime’s The Untold History of The United States, a reporter and producer for Associated Press Television News, VH1, and A&E, and host of the web series “Scandalous Washington.” She has written and lectured widely on American social, cultural, and pop culture history. She received a bachelor’s degree from Georgetown University and a master’s degree in communications and master’s and doctorate degrees in history from American University. For more about Gueli and Washington’s Lipstick Brigade, visit her website or find her on Twitter @historybyte. Each February, the U.S. Capitol Historical Society commemorates Black History Month with a lunchtime lecture or similar event. This year, we’ve partnered with the Senate Historical Office and the Illinois State Society to offer a panel of historians speaking about Reconstruction Era black congressmen and, more specifically, Senator Blanche K. Bruce—the first black man elected to a full Senate term. Bruce was elected to the Senate by a Reconstruction-era Mississippi legislature in 1874, after a quick rise through different roles in local and regional governing bodies. He had been born into slavery in Virginia in 1841 and was a personal servant to his half-brother, alongside whom he learned to read. He escaped during the Civil War and, after a stint working as a porter on the Mississippi, became a successful planter along the river’s banks. By the time he arrived in Washington in 1875, Bruce was a well-known politician in Mississippi and well-off compared to most of his black constituents. Throughout his time in public service, he walked a fine line in trying to please both white and black supporters, not to mention different factions of the Republican Party. Bruce waited a year before speaking out in the Senate, similar to the period many other new senators waited. His clearest support for blacks related to issues affecting black veterans, but he also argued against the Chinese Exclusion Act and criticized federal actions regarding to Native Americans. However, neither white conservatives nor black constituents seemed convinced that Bruce was doing enough, or well enough, to continue in the Senate, and Bruce did not run for a second term in 1880. After his Senate career, Bruce served in several capacities in the Republican party and was mentioned as a possible candidate for federal positions, including Cabinet positions and ambassador to Brazil. (He turned down the later because slavery was still legal in Brazil.) 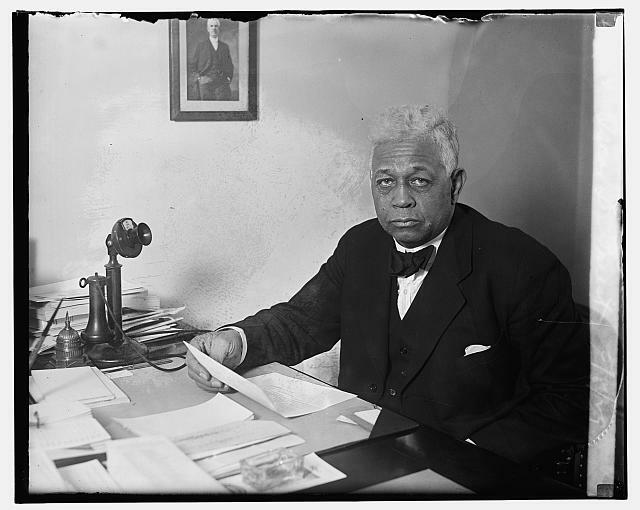 He held positions in DC as register of the U.S. Treasury and as DC’s recorder of deeds as well as serving on the board of trustees for Howard University. Bruce died of complications from diabetes on March 17, 1898 in Washington, DC. In October 1999, the Senate Commission on Art approved the commission of a painting of Bruce for the Senate collection. Artist Simmie Knox relied on a Mathew Brady photograph of Bruce to guide the work, which now hangs in the Senate wing of the Capitol. To learn more about early black Members of Congress, Blanche K. Bruce, or his portrait, join USCHS for the panel on February 17, 2016. Black Americans in Congress, 1870-2007. (Washington, DC: 2008) Editor-in-Chief Matthew Wasniewski, now Historian of the House, is one of our panelists. Most of the information in this post is drawn from the entry on Blanche K. Bruce. Back in May, our annual symposium focused on “Congress, the Home Front, and the Civil War.” C-SPAN recorded some of the proceedings, and now American History TV is airing them as part of its Civil War series. Once they air, the talks are always available in C-SPAN’s online archives. Paul Finkelman’s “‘I Could Not Afford to Hang Men for Votes’: Abraham Lincoln and the Dakota War Pardons” aired at the end of August. Kenneth Winkle’s “‘The Best Place to Try the Experiment’: Emancipation, Rights, and Racial Equality in Civil War Washington” aired last weekend. Coming up this weekend, Guy Gugliotta discusses “The United States Capitol during the Civil War: A National Icon Comes of Age”. Watch it live on C-SPAN 3 on Saturday at 6 and 10 pm or Sunday at 11 am or check it out online after the first airing. Also airing this weekend: USCHS Capitol Fellow Debra Hanson’s August lecture on Daniel Boone’s portrayal in Capitol artwork. It’s on at 5:15 pm on Saturday and 4:15 am on Sunday, and it’s also already available online (click the link above). We’ll have a few additional August lectures airing in the next few months, so keep an eye on AHTV to learn more! On Wednesday, February 13, the U.S. Capitol Society will present its annual African American History Month lecture in Washington, DC. This year, Historian of the House of Representatives Matthew Wasniewski will discuss the life and career of Chicago politician and Member of Congress Oscar Stanton De Priest, the only black Member of Congress when he was elected and the first from the North. We’ll leave it to Dr. Wasniewski to dig into the details; instead, here are a few interesting tidbits about De Priest’s time in Congress and Washington. *When the 71st Congress arrived in Washington in April 1929, the House took the oath of office en masse for the first time. Speaker Nicholas Longworth altered the tradition of swearing in Members by state delegation in large part to prevent any challenges to the legality of De Priest’s seating. After a few varied years, in 1937 the en masse oath-taking became standard. *First Lady Lou Hoover invited De Priest’s wife, Jessie, to a tea for congressional wives. The invitation provoked national discussion and outrage from many, but Hoover navigated the rocky shoals of race and segregation carefully; the reception was broken up into several sections, and Jessie De Priest attended the smallest event of four. (The White House Historical Association has much more on this topic.) Oscar De Priest challenged the conventions of segregation in several areas of the Capitol as well, including the House’s public restaurant. *De Priest won several re-election campaigns, but lost in 1934 to another African American politician, Democrat Arthur Mitchell. It was an unusual campaign because both candidates were black; Mitchell became the first black Democrat in Congress. Want to learn more? The noon lecture on Wednesday is free and open to the public, but we do ask that you pre-register. You can find more information on our website. For more about De Priest, read his profile based on Black Americans in Congress 1870-2007, or this House Historical Highlight on De Priest’s challenge of segregation in the House dining room. This evening, we are holding our annual Freedom Award presentation, which we have done every year since 1993. The award, according to our website, is given “to recognize and honor individuals and organizations who have advanced greater public understanding and appreciation for freedom as represented by the U.S. Capitol and Congress.” This year’s award is being presented to documentary filmmaker and historian Ken Burns. Having taught American history to high school students, I often used his brilliant documentary, The Civil War, drawn heavily from the three- volume history written by Shelby Foote, when covering the war, as it was and still remains a wonderful way to help make conflict—and the people who fought it—real to them. While Mr. Burns has created a number of outstanding historical documentaries, I would put forth that he is certainly best known for his series on the Civil War. There are so many memorable scenes depicted and stories shared throughout the documentary—the photographs and journals bringing to life the hardships of the slaves over whom the war was being fought; the soldiers who were dying in record numbers, regardless of which side they were on, and the families they left behind. It focused on the political and military aspects, as well as the human ones, painting a picture of how heavily the war hung on President Lincoln and other political leaders of the time, as they worked to save the Union; on the other side, the documentary did well to also tell the story of the Confederacy and what they believed they were fighting for, which of course, is a sign of a great documentary: an unbiased observation of events through the eyes of the people that lived them. Speaking of the Civil War, it is worth noting that although we posted about Constitution Day on Monday, September 17th, it was also the anniversary of the deadliest single day that was fought in that conflict and in American history, the Battle of Antietam, which took place on September 17, 1862 not too far from here in Sharpsburg, Maryland. 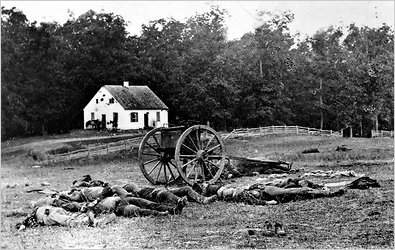 All told, that battle left over 23,000 men on both sides either dead or wounded; although the Confederate Army lost slightly fewer men than the Union Army, General Robert E. Lee lost a quarter of his total army that day. While there have been other horrific days in American history that have taken the lives of many of our citizens, none amounted to a greater, single loss than on this day. I will be eager to hear what Mr. Burns has to say this evening, although I’m told he wants to use most of his time to answer questions from those in attendance, which I think will make it all the more interesting for everyone, especially for someone like me. Regardless of what is or isn’t said in everyone’s remarks tonight, it is clear that the Society is bestowing this award upon a worthy recipient in Ken Burns, who really has done a tremendous amount to make our history accessible to the masses in a way that makes you walk away feeling like you have truly experienced something, which is no small feat.